Nakhon Pathom is claimed to be the country’s oldest settlement. The town’s name derives from the Pali „Nagara Pathama“ which means as much as „first city“. The town is home of the world’s tallest stupa: Phra Pathom Chedi, 127m high and located in the centre of Nakhon Pathom. The original stupa has been built during the 6th century by the Theravada Buddhists of Dvaravati – supposedly at the same time as the Shwedagon Pagoda in Myanmar. It is now buried within the massive orange-glazed dome. 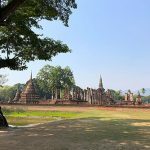 While the Khmers built a Hindi-Khmer style stupa over the sanctuary, the Burmese destroyed it once again while conquering the city in 1057 and it wasn’t until 1860 that King Rama IV (King Mongkut) restored the stupa. There is no admission fee for foreigners to enter the stupa (yet). Starting in the late afternoon, there is a big traditional Thai outdoor market every day selling clothes and lot’s of Thai food right in front of the main entrance. Nakhon Pathom is one of the smaller province capitals and so it doesn’t have a central bus station. Most buses and minivans depart and arrive from near the train station and the market. There is a regular minibus service from Bangkok’s Victory Monument, one way fare 60 Baht, about 1 hour. 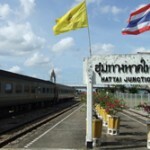 Alternatively you can catch a train from Hua Lamphong main railway station, one way 14 to 60 Baht depending on the type of service. Departures roughly every hour from early in the morning till late at night.